In the heart of the big city of San Francisco, a relatively quiet, forested canyon with a few chert cliff bands can be found only a mellow ten-minute stroll from the car down a nice, flat, shady trail. It is the only (and therefore the best) bouldering in the city and even has good parking. 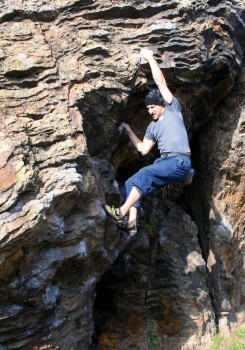 Climbers have been scaling rocks in the park since at least the 1930s and probably even longer than that. Rock climbing at Glen Canyon Park was even mentioned in the Sierra Club newsletter, The Yodeler, in 1940. No big V-grades to be bagged here, but a long, pumpy traverse and a lot of fun, moderate highballs should quench your thirst for stone. The unique Radiolarian Chert is neat to look at, let alone grab onto and climb. Perfect cracks and finger slots cover most faces and allow many options for hand and foot holds. Which SuperTopo guidebooks cover Glen Canyon Park? Mike Whipple enjoys Jugs (V1).